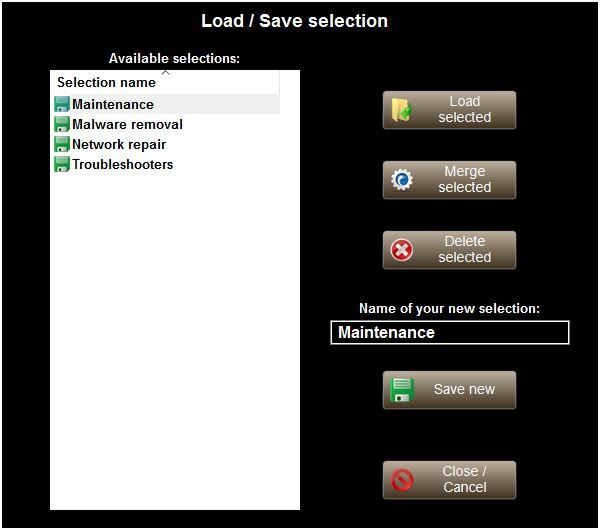 The Load/Save selection dialog box can be accessed through the list's context menu, by selecting Load / Save selection. This dialog box is similar to the screenshot below. At any point, you can press Close / Cancel, if you changed your mind, and no longer want to load or save a selection. Click the desired selection in the list. If you want to load this selection, press Load selected. Otherwise, if you want to merge the hilighted selection, press Merge selected. Merging a selection does not clear the current selection of tools in the list. The saved "selection" contains the check state of the tools in the list as well as the expanded state of each group. If you want to save the current state of the tools list, enter a name for your new selection, and press Save new. If you give an already existing name, you will be prompted to confirm to overwrite the existing file. You can easily delete the previously saved selections. To do so, select the one you want to delete, press Delete selected and confirm. Currently you can only delete one selection at a time.